Now it is a time to get worried as stock market has fallen for the fourth consecutive day and has broken the key support of 5800 levels. The trend of Nifty is in downtrend as 257 shares were only up during the course of the day with balance trading in negative territory. To add fuel to fire, we have indications that RBI may not cut the CRR rate as inflation monster is again rising. Moreover current account deficit is going to balloon due to falling rupee against dollar and RBI intervention can be expected. At this juncture it is advisable to avoid banking and real estate stocks as rate cut hope is dim. It is worthwhile to mention here that index has broken the support at points 5800 and if Nifty remians below this point we are bound to see levels of 5760-5711-5500 levels. 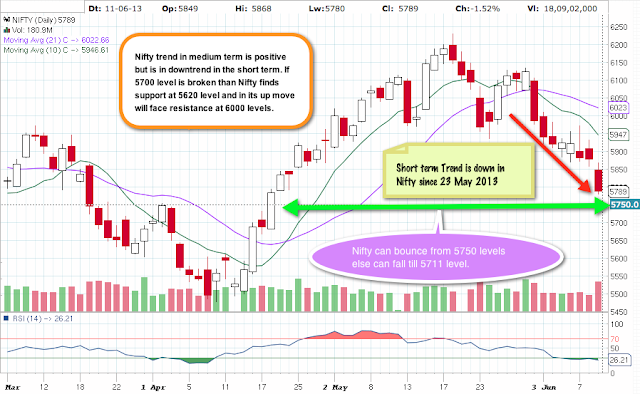 Technical bounce back generally occurs near supports and thus wee may see Nifty bouncing back near 5750 levels. Nifty is in downtrend since 23 May 2013 and this trend remains down in the short time. On provisional basis, FII's sold Rs 1.14 bn worth of Indian equities, while DII's sold Rs 0.69 bn worth of equities. DR Reddy, MC Dowell, CESC, Hind Uni Lever, Arvind, Infy, Havells, TCS, HCL Tech & Tech Mahindra. Opto Circuits, Jindal Steel, HDIL, Renuka, JP Power, JSW Energy, IVRCL Infra, Jain Irrigation, India Cement & Titan. This article was first published on Indian-Share-Tips.Com on 11 June 2013 & we will seek your support to share the post if you found it interesting and spread the good work done by us as stock market blogging is a continous tiring task and we have been doing it for a tremendously long time. Do remember to go through the comments to know the reader views or our updates from analytical point of view. Do not miss the latest comments.